Nobody wrote a song about Vince DiMaggio. It was his lot in life to be outshone by his kid brothers. He’s the DiMaggio who set the single-season record for strikeouts by a batter. Vince and strikeouts go together like Joe and Marilyn. He led the National League six times. He didn’t deliver the home runs to justify the whiffs; his career high was 21. But he fashioned a 10-year big-league career as an elite center fielder with a powerful arm and was selected for two All-Star teams during World War II. Most famously, Vince recommended brother Joe to the San Francisco Seals in 1932, and Joe took his job. “Maybe if I had kept my mouth shut, I’d be remembered as the greatest DiMaggio,” Vince said decades later.1 If we could hear his tone of voice, maybe we’d know whether he was joking. The DiMaggio brothers’ father, Giuseppe, came to California from Sicily in 1898 and fished in San Francisco Bay from a tiny 16-foot boat. It took him four years to save enough to bring his wife, Rosalie, and their daughter, Nellie, to join him. Eight more children were born in California, one about every other year. Eldest sons Tom and Mike played some ball — Vince always said Tom was the family’s best player ­— but they dutifully took their places on the fishing boat with their father. Vince the handsome rebel was the son with personality. “He was always singing, full of life,” Papa DiMaggio remembered.5 Joe, as shy as Vince was voluble, began playing ball by tagging along with his big brother. He made a name for himself on the San Francisco semipro circuit. In the last week of the 1932 season, the Seals were shorthanded because they had allowed outfielder Hank Oana and shortstop Augie Galan to leave early for a barnstorming trip to Hawaii. Vince recommended Joe, not yet 18, and the brothers appeared in the lineup together for the first time. Playing three games, Joe slammed a double and a triple in nine at-bats while endangering spectators with his wild throws from shortstop. Vince, in center field, hit .270 in 59 games for the Seals. The next spring he developed a sore arm and couldn’t throw. Joe won the right-field job, so the DiMaggios played side-by-side, but Vince lasted less than a month before he was released. The team cut several other players to reduce the payroll as the Depression held attendance down. In probably the toughest minor league in the country, Joe was a sensation at 18 years old. Taking over in center field, he hit in 61 straight games and batted .340. Vince, picked up by the Hollywood Stars, hit .333 with 11 homers in 96 games. Vince spent the next three seasons in the Coast League. After the Hollywood franchise moved to San Diego in 1936, he was a teammate of teenagers Ted Williams and Bobby Doerr. He earned a reputation as the league’s best defensive center fielder while batting .286 with 60 home runs over the three years. Meanwhile, Joe moved up to the Yankees in 1936 and was anointed as the successor to the retired Babe Ruth. In December 1936 the news broke that “Vince DiMaggio, Joe’s brother,” had been sold to the Boston Bees.6 Manager Bill McKechnie, who built his teams around strong defense, wanted Vince for his center-fielding skills. Since the Bees and Yankees both trained in St. Petersburg, Florida, the brothers got together for dinner in the spring and could celebrate Dominic’s signing with San Francisco. DiMaggio struck out twice in his big-league debut and seven times in his first seven games. After he fanned four times in one game, McKechnie ordered him to choke up on the bat and shorten his swing. DiMaggio reeled off a 10-game hitting streak from May 7 through May 21, but then went 0-for-15 and fell back on his old habits. Vince set his unwanted record in 1938, when he struck out 134 times.10 He whiffed in almost 22 percent of his plate appearances, more than twice the league average. His batting average slid to .228 and his OPS to .682. That wouldn’t do. In 1930s baseball, a strikeout was an embarrassment, 134 of them a humiliation. Babe Ruth never struck out 100 times in a season. The few who did were either fearsome sluggers — Jimmie Foxx, Dolph Camilli — or all-American outs ­— Frankie Crosetti. Joe DiMaggio never struck out more than 39 times in any season and often had more homers than strikeouts. Kansas City was a Yankees farm club, but there was no chance of a brotherly reunion. The powerful rookie Charlie Keller was set to join Tommy Henrich flanking Joe in the New York outfield, and the club had George Selkirk, a lifetime .302 hitter to that point, on the bench. DiMaggio’s power splurge helped the Blues win 107 games and the pennant. And it won him another shot in the majors. The Cincinnati Reds, managed by Bill McKechnie, bought his contract for delivery at the end of the American Association season. The Reds were on their way to the National League pennant, but had outfield problems. Vince wasn’t the answer. In eight September games, he totaled one hit and 10 strikeouts in 14 at-bats. The Reds were swept by Joe’s Yankees in the World Series, but Vince, as a late-season call-up, was not eligible to play. Still, 1939 was a game-changing year for the DiMaggios. While Vince was slugging for Kansas City, Joe was elected the American League Most Valuable Player, Dom the Pacific Coast League MVP. 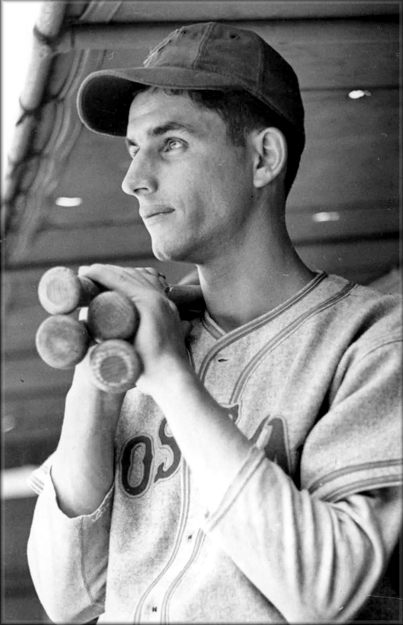 In 1940 Dom, 23, joined his brothers in the majors, winning the center-field job with the Boston Red Sox. Aside from the same dark, curly hair and a vague facial resemblance, the three were not much alike. Joe, 6-foot-2, was the greatest star on the greatest team; Vince, 5-11¾ by his own reckoning, was trying to resurrect his career; and Dom, 5-9, trying to establish his. Their personalities were just as different. “Likable and affable, Vince has a far warmer personality than either of his brothers,” wrote Arthur Daley of the New York Times. “Whereas a brief ‘uh-huh’ was a full-flowered conversation for the reticent Joe and where Dom is shy and retiring, Vince is expansive.”14 They were most similar in center field, where all were among the best in the game. Whatever Vince had found in Kansas City, he brought it back to the majors with him. After Cincinnati passed him on to the Pittsburgh Pirates in early 1940, he put up the best numbers of his career, a .289/.364/.522 batting line with 19 homers in 110 games for the Pirates. The next year he cut his strikeout rate to 15.5 percent and registered career highs with 21 homers and 100 RBIs. He strung together a 12-game hitting streak and a pair of 10-gamers, but combined they added up to only about half of Joe’s historic 56-game streak that summer. The Pirates and DiMaggio parted company over a steak. Returning to the team’s hotel after a night game in New York in July 1944, he found that the only eating place still open was the nightclub. When he ran up a $9 tab, twice the Pirates’ meal allowance, management deducted the excess from his paycheck. Incensed, he demanded a trade.16 (“Feed me or trade me”?) He spent the last two months of the season in the doghouse and mostly on the bench. As the Phillies slogged to another last-place finish, DiMaggio put his name in the record book again, this time for an accomplishment worth remembering. He hit four grand slams during the 1945 season to tie the major-league record shared by Frank Schulte, Babe Ruth, Lou Gehrig, and Rudy York.18 Just to show that he hadn’t changed, he led the league in strikeouts for the sixth time. On September 7 at Cincinnati, DiMaggio slammed an RBI double in the first inning off 18-year-old Hermie Wehmeier, who was making his major-league debut, then doubled home another run in the second off 46-year-old Hod Lisenbee, pitching the final game of his career. DiMaggio crashed into the center field wall in the eighth, breaking his right elbow and ending his season. The likes of Wehmeier and Lisenbee vanished from the majors in 1946 when the war veterans came home. Army veteran Johnny Wyrostek took DiMaggio’s job in center field. On May 1 Philadelphia traded the 33-year-old DiMaggio to the Giants, his fifth team. His stay in New York, where Joe had just rejoined the Yankees, lasted barely a month. He went 0-for-25 and was sold to the San Francisco Seals, where he had started 14 years before. Seals manager Lefty O’Doul achieved the DiMaggio trifecta; Vince’s arrival meant he had managed all three brothers. While Dom played in his only World Series with the Red Sox in 1946 and Joe struggled to recapture his prewar form, Vince was a benchwarmer in Triple A. San Francisco released him after the season. DiMaggio was working in a sporting goods store the next spring when his old manager Casey Stengel signed him for the PCL Oakland Oaks. He hit over .330 and belted 11 homers in the first two months of the season, but tailed off to a final .241 average. In 1948, he began a new career as a player-manager, first at Stockton in the Class-C California League and then for 2½ years at Class-D Pittsburg, California, until that franchise folded midway through the 1951 season. After finishing the year with Class-B Tucson, he left the game at 38. Vince was especially happy driving a milk truck, when he “would start at 4 a.m. delivering milk, butter and eggs to homes, and in the afternoon I would be going after bass in the Sacramento River.”20 Fishing was a pleasure as long as he didn’t have to do it for a living. He finally settled in the Los Angeles area and had stints as a bartender and a liquor salesman. They got together in uniform for occasional old-timers games. They first played in the same outfield at a 1956 San Francisco Seals reunion organized by Lefty O’Doul. Thirty years later, after Joe and Vince had a falling-out, Dom persuaded both to join him for an old-timers day at Fenway Park. Soon afterward Vince was diagnosed with colon cancer. He died at 74 on October 3, 1986. “I’ll tell you this, I never felt I played in the shadow of either of them,” he insisted in old age. “Joe was a better batter, but I could play rings around him as far as knowledge of the game and plays in the outfield. I could smoke those throws. If you put a dime on second base, I could hit it from the outfield. This biography was reviewed by Jan Finkel and fact-checked by Kevin Larkin. 1 Edward Kiersh, Where Have You Gone, Vince DiMaggio? (New York: Bantam, 1983), 260. 2 Family history from Tom Clavin, The DiMaggios (New York: HarperCollins, 2013) and Richard Ben Cramer, Joe DiMaggio: The Hero’s Life (New York: Simon & Schuster, 2000). 3 David Halberstam, The Teammates (New York: Hyperion, 2003), 123. 5 J.G.T. Spink, “‘That’s Our Pop’ — Dominic DiMaggio, Sr.,” The Sporting News, January 9, 1941: 4. The story erroneously identified Giuseppe DiMaggio as Dominic Sr.
6 Burt Whitman, “Vince DiMaggio, Joe’s Brother, to B’s in Deal for Chaplin, Thompson, Cash,” Boston Herald, December 5, 1936: 19. 7 Arthur Sampson, “Bill McKechnie Seeks Whiffer,” Boston Herald, August 13, 1939: 60. 8 Dave Larsen, “A DiMaggio Named Vince … And His Brush With Baseball Fame,” Los Angeles Times, February 27, 1983: VIII-1. 9 The record stood for 54 years, broken by Jason (41) and Jeremy (20) Giambi in 2002. 10 The record stood for 22 years, until Detroit’s Jake Wood registered 141 strikeouts in 1961. 11 “Morning Briefing,” Los Angeles Times, October 6, 1986: III-2. 12 Whitman, “B’s Use Vince DiMaggio as Installment on Miller,” Boston Herald, February 5, 1939: 38. 13 Ernest Mehl, “Vince DiMaggio Is Transformed into a Big Threat of Baseball,” Kansas City Star, May 24, 1939: 21. 14 Arthur Daley, “Sports of the Times,” New York Times, July 29, 1943: 23. 15 Ibid., April 23, 1944: S2. 16 Havey J. Boyle, “Hunger Strike in Reverse Looms in Buc Nosebag Issue,” Pittsburgh Post-Gazette, August 11, 1944: 14. 17 Boyle, “Mirrors of Sport,” Post-Gazette, April 2, 1945: 14. 18 Ernie Banks broke the record with five grand slams in 1955. In 2018 the record is six, by Don Mattingly and Travis Hafner. 21 “Joe DiMaggio’s brother tells how faith helped him conquer booze and gambling,” unidentified clipping in Vince DiMaggio player file at the National Baseball Hall of Fame library, Cooperstown, New York. 22 Clavin, The DiMaggios, 262-263. 23 Kiersh, Where Have You Gone, 260.